Get the best productivity, comfort and injury prevention possible by utilizing the best fitting office chair possible. The best fit comes from an eye toward dimension. There are two major areas of concern when discussing chair dimensions. First, there is the actual size of the chair in question, and second, the dimension of the person who will be using the chair. The overall height of an office chair varies depending on the height of the backrest and if there is a neck rest; the range is 31 inches to 40 inches from the floor to the top of the chair. One of the first studies of human dimensions was conducted by the U.S. military during World War II. Hundreds of American soldiers were measured. Anthropomorphic data (the study of calculating body measurements) was gathered, and the numbers were averaged. 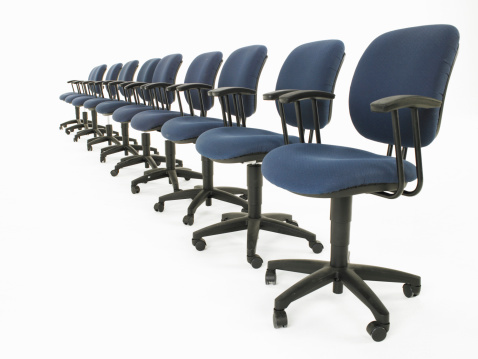 The assumption was that those measurements covered about 95 percent of the population and are the dimensions many manufactures still use when determining what size to make their office chairs. There are problems with this, however, and they stem from a few specific factors. Sizes vary based on age, gender, race and even occupational group. The original data came from active men in their 20s. Herman Miller, an office furniture manufacturer, has conducted its own anthropomorphic research and believes that actually only about 60 percent of the population is actually comfortable and performing optimally with a standard office chair. Two people that are the exact same total height and gender but have different leg, arm and torso measurements would need two differently adjusted chairs. How Important Is a Comfortable Office Chair? A large percentage of the population spends somewhere between five to eight hours a day sitting at a desk. A chair that is slightly uncomfortable, even if being utilized for a short duration, can develop into a painful injury from the cumulative time spent using it. This sort of injury is called musculoskeletal disorder or MSD for short. According to the federal Occupational Safety and Health Administration (OSHA), nearly 2 million workers suffer work-related MSDs every year, and about 600,000 lose time from work as a result. In the same OSHA report, Charles Jeffress, an assistant secretary for OSHA in 2000, said that "$1 of every $3 spent on workers' compensation stems from insufficient ergonomic protection. The direct costs attributable to MSDs are $15 to $20 billion per year, with total annual costs reaching $45 to $54 billion." The most ergonomic fully adjustable office chairs can be expensive. However, in the face of potential injury, an office chair with the proper dimensions for its user will save time and money in the long run.